It is with a heavy heart and sadden eyes, we report to the world that has shown support and love for Chum and Champ.... Chum has passed away peacefully last night in the arms and paws of her family and Champ her soul mate. Many of us cannot believe the news, yet unfortunately it is true. She is now on that rainbow bridge back with her human mom Edith. May she always be remembered for how she touched our hearts, and left those brilliant paw prints and for what kind of fur kid she was. We love Chum, even though we never got a chance to meet her in person, just the pictures, the posts the stories. Made us feel close to her. We were part of the group that advocated for her freedom, even though her freedom was short lived, we know deep in our hearts, that she at the end, knew she was loved by all. At this point and time everyone who was involved with the chum and champ groups will be taking a short break, to mourn the loss of a great fur kid (Chum). As many of you know, it took two months for the CVRD to release only a portion of Chum’s medical records (none of Champ’s have been released to date). On April 12, 2013 I received an email from Rebeka Breder letting me know that the CVRD (Troy Desouza) had finally agreed to share some of Chum’s file including some x-rays. It took another week for the vet holding those documents to forward them to Chum’s new doctor on April 22, 2013. The x-rays caused the new vet to believe Chum may have been misdiagnosed for all of these months during her incarceration. Wednesday, April 24, 2013, Chum was taken to Can West in Vancouver with the intent of having new x-rays, an MRI, a CAT scan and new blood work etc… We were all relieved thinking that once the x-rays confirmed it was a cruciate injury, Chum would have her surgery and be home the next day. The specialist who examined Chum was suspicious of the cruciate injury diagnoses. He had her x-rayed (without anesthetic to avoid complications). An hour later, the specialist confirmed our worst fears. Chum has bone cancer. The cancer has eaten through her leg bone and fractured it. He said in some cases they are able to amputate to save a dog’s life, but there was more bad news. Chum’s lungs are completely full of cancer. The specialist was flabbergasted that she is still walking/hobbling and couldn’t understand why she wasn’t coughing and struggling for breath. He has said Chum may have two weeks left to live. I was with Chum yesterday, and will see her again today. She is not the same dog that she was 9 days ago during my visit. Although she is now heavily medicated to alleviate her pain, Chum is labouring and I don’t believe she will be with us for more than a few days. We are all devastated at this news. Chum has been put through so much cruelty this past year and to find out now that she has suffered with the pain of cancer for months and that none of the “three” vets hired by the CVRD found the cancer (or shared their findings if they did know) has added another layer of devastation to an already tragic story. When I think of how she almost died at the SPCA and all of the tests, needles, trial drugs, poking and prodding, and never once did she whimper or complain. I am in awe of Chum’s courage and her gentle nature. I honestly don’t know another dog who would have tolerated so much at the hands of humans without reacting. Everyone who took part in falsely accusing Chum of attacking a dog, all the way down the line to the SPCA and their vet who allowed both dogs to be released in October 2012 with multiple infections, to the Animal Control Officer/Bylaw Officers, the CVRD and the Judge himself should be made aware of the absolute inhumanity of what they have done to both of these dogs. If I were any one of them I would hang my head in shame. None of them are deserving of the job titles they hold or the paycheques they take home. We all fought for more than a year to save Chum and Champ, first from being destroyed and later, from being sent to inappropriate placements (Spider Lake and the Saskatchewan breeder). On February 22, 2013 when Chum was finally released and reunited with Champ, they were both rehomed with a member of my family. We were so happy to know that both of these Gentle Giants had survived this horrible ordeal and that they would remain in our family to live out their days together in good health and happiness. And now, because the system doesn’t require the CVRD or the SPCA (or their hired vets apparently) to provide adequate health care for dogs who are seized and impounded, Chum has suffered excruciating physical pain without relief. There are no words to express our grief and anger over Chum’s continued suffering and the knowledge that she will be taken from us so quickly. Chum will soon be at peace and Section 49 will have claimed another victim. The bloated machine of local government spouting public safety will no longer be able to hurt her. Champ will again have to learn to live without his lifetime mate…this time forever. Chum and Champ’s tragedy has cost two lives, Edith’s and very soon Chum’s. I have always erred on the side of asking all of you to write in a respectful and courteous manner but now I am asking you to put your anger and sadness into words. Please contact the media, the CVRD, BC Tourism and the Provincial Government and anyone you may know in BC, to protest against what has happened to these dogs with the intent of preventing it from ever happening again. So yes, the saddest truth. Chum is on the Rainbow bridge. 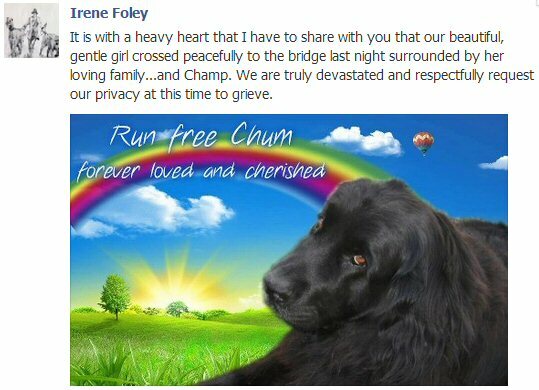 We love you Chum and we continue the battle to save all the innocent dogs in the BC area. No one will be silent, no one will give up, we will continue on in your name and other's who were taken away. Rest in peace, our sweet Chum.